England has a long and colorful history, and many of Americans can trace their roots back to this small island. Many may find it daunting researching records from a different country, but this guide is here to help you navigate you through the vital records available to help you track down your forefathers. Records for Wales, Scotland and Ireland are not included in this guide – this guide focuses solely on records for England. Civil registration began in 1837 in England and Wales. This meant that all births, marriages and deaths had to be reported to the local registrar, who would then pass on the information to the General Register Office. Although the actual certificates are not available to view online, there are extensive indexes readily available on Ancestry, FindMyPast and FamilySearch. Maiden names of mother are not included in the index on Ancestry, FMP, or FamilySearch. Maiden names can be found only on the General Register Office Index website. Maiden names of mothers are listed on the 1916-2007 index on all sites. Both sets of indexes will include the full name of the child, the area office where their birth was registered, year and quarter (Jan-Feb-Mar, Apr-May-Jun, Jul-Aug-Sep and Oct-Nov-Dec). New parents have up to 42 days after the baby is born to register a birth. This can explain why sometimes a child who is known to have been born in June can be found listed as a Jul-Aug-Sep baby. An example of a civil registration birth certificate (in PDF form from the GRO) is this birth record for my 3x Great-Grandmother Hannah Amelia Dare from 1855. General Register Office. Birth Certificate, PDF, Bermondsey, Surrey, Hannah Amelia Dare, Apr-May-Jun 1855, Vol 1d, Page 83. Prior to civil registration beginning, births were not routinely recorded. However, baptisms and christenings were. These baptism records were recorded into large volumes at the local churches and these can go back several hundred years. Many baptism records include the date of baptism, the actual date of birth, parent’s names and sometimes the address they were living at. An example of an early baptism record is seen below in the baptism record of my 5x Great-Grandfather and his twin sister on 10th February 1786 at St Mary’s Church, Rotherhithe, London. “London, England, Church of England Baptisms, Marriages and Burials, 1538-1812”, entry for James Edghill, 10 Feb 1786, St Mary, Rotherhithe, database and images, Ancestry.co.uk (www.ancestry.co.uk: accessed 12 Nov 2018); citing LMA, Church of England Parish Registers, 1538-1812; Ref No: P71/MRY/012. 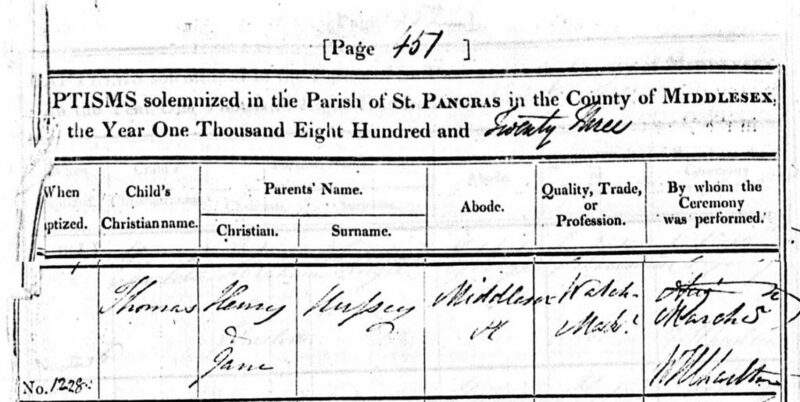 Another example of an early baptism record is that of my 4x Great-Grandfather Thomas Hussey from 1823. A standardized form started being used in some of the churches and this included the profession of the father, area of residence and the name of the person who performed the ceremony. “London, England, Church of Births and Baptisms, 1813-1917”, entry for Thomas Hussey, 9 Nov 1823, Old St Pancras, Camden, database and images, Ancestry.co.uk (www.ancestry.co.uk: accessed 12 Nov 2018); citing LMA, Church of England Parish Registers, 1754-1906; Ref No: p90/pan1/013. Many of these baptism records are available online on the aforementioned genealogy sites and will be grouped together by the County they were performed in (although it will list the church and town). FindMyPast and Ancestry both have different baptism records, so it is important to check both sites. As with birth records, civil registration marriage indexes are available online. Entries do not include name of spouse. Entries include full name of person, last name of spouse, district of where marriage took place, as well as volume and page number. Marriage Banns are an extremely useful resource. Marriage banns were notices that announced a couple’s intention to marry. These notices were posted outside of churches for 3 Sundays before the wedding. This would give ample time for any person to object the marriage on possible legal grounds e.g. previous marriage not having been dissolved. Early marriage banns included the details of the engaged couple, the date and location of the wedding and the witnesses, as seen below in the 1774 Marriage Bann of my 6x Great-Grandparents Benjamin Edghill and Mary Macey. 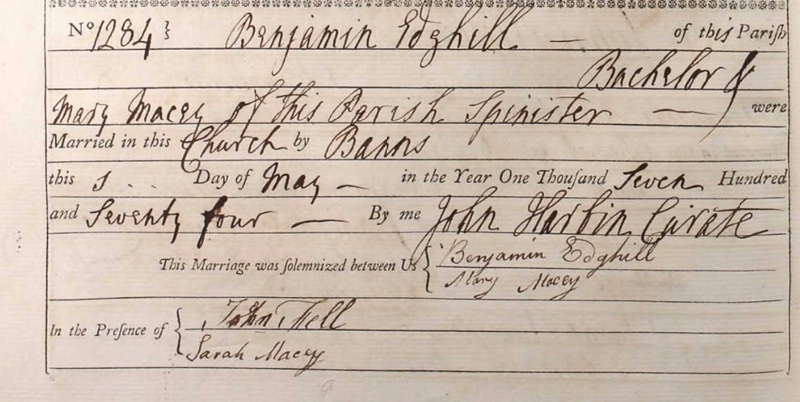 “London, England, Church of England Marriages and Banns, 1754-1932”, entry for Benjamin Edghill, 1 May 1774, Marriage Bann, St Leonard, Shoreditch, London, database and images, Ancestry.co.uk (www.ancestry.co.uk: accessed 12 Nov 2018); citing LMA, Ref No: P91/LEN/A/01/Ms 7498/8. As time moved on, more details began to be included on the Banns. This Marriage Bann is from 1892 when my Great-Great-Grandparents, William Torrance and Emily Medhurst were married. As you can see, many more details have been added, including the couple’s age, their professions, residence at time of marriage, father’s names and professions. “London, England, Church of England Marriages and Banns, 1754-1932”, entry for Torrance-Medhurst, 5 Jun 1892, Holy Trinity, Islington, database and images, Ancestry.co.uk (www.ancestry.co.uk: accessed 12 Nov 2018); citing LMA; Ref No: p83/tri/018. Not all county and city marriage banns are available to view online but can be found at archives around the country (see section on repositories). Civil Registration Death records follow the same time period indexes as birth and marriage. Both sets of indexes contain the same information: name, approximate age, approximate birth date/year, location and quarterly date of death. An example of a civil registration death certificate (in PDF form from GRO) is that of my 3x Great-Grandfather James Dugdale Edghill from 1909. General Register Office. Death Certificate, PDF, Southwark, London, James Dugdale Edghill, Jan-Feb-Mar 1909, Vol 1d, Page 18. Burial records are a useful tool for finding a death date before civil registration records. They have the added bonus of telling you where your ancestor was laid to rest. As with other church records (baptisms and marriage banns), the burial records are categorized to the county or city the event took place in. Ancestry and FMP have many different counties in their catalog. Institutions such as hospitals, prisons and workhouses also kept their own detailed burial registers. My Great-Great Grandfather Frederick Donoghue died in the infirmary of the St George workhouse in London, and his burial was recorded in their register. “London, England, Church of England Deaths and Burials, 1812-2003”, entry for Donohue Fred^, 11 Apr 1907, St George -in-the- East Union, database and images, Ancestry.co.uk (www.ancestry.co.uk: accessed 12 Nov 2018); citing LMA, Board of Guardian Records, 1834-1906, Ref No: STBG/SG/110/03. Deceased Online is a large database of UK burial and cremation records. Searches are free, but for a small fee, you can get access to cemetery maps and digital scans of burial and cremation registers. The Burial Register Scan for my Great-Great-Grandfather Henry John Donald is seen below. “Burial Register Scan”, Henry John Donald, 26 Sep 1917, Manor Park Cemetery, Newham, digital image, DeceasedOnline (www.deceasedonline.com: accessed 12 Nov 2018). For the civil registration vital records I have covered above, the easiest and most cost effective way to order them is to go through the General Register Office website. The GRO also began a PDF service for Births 1837-1917 and Deaths 1837-1957. For a reduced cost, they will email you a PDF version of the certificate you request. However, it is important to note that this will not be a certified certificate and so cannot be used for official purposes. The National Archives in Kew, Surrey holds one of the largest collections of genealogical records. Their website has many of their collections available to view online, as well as useful guides covering a wide range of records they hold. You can also order record copies from them,and make use of their paid research service. All details can be found HERE. 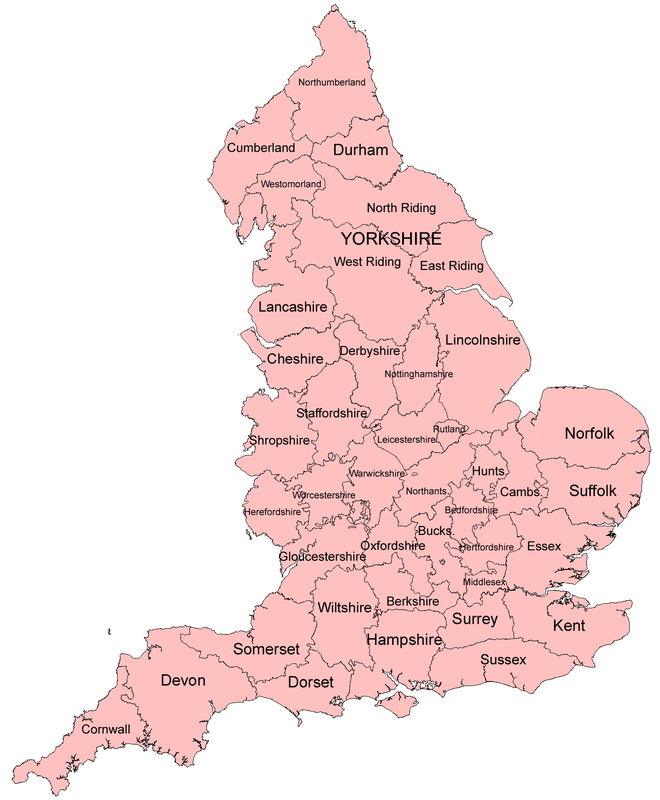 Most counties and cities in England have their own Genealogical or Historical Societies. If you are looking for a particular record set, or have questions about the area, contact these societies! They are often very happy to help out with research,or advise you. I hope this guide helps those of you are trying to discover your English ancestors! Stay tuned for future blog posts detailing other record sets unique to England. 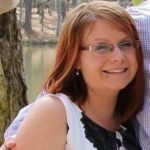 Becky Zoglmann is an English Genealogist who now resides in Georgia with her family and small army of rescue animals. She specializes in English records and has a passion for Victorian London. She is the owner of RJZ Genealogy and is the Content Coordinator for NextGen. Find her online at RJZ Genealogy, Facebook and Instagram. This entry was posted in Education Hangouts, Guest Blogger, Education Hangouts, Guides, NGGN Information.